Styled with cézanne pant . This is a relaxed-fit sweater with a half-cardigan stitch for texture. It's made with a fine-gauge yarn that's lightweight yet warm. Love the fit. Comfortable and cozy yet stylish! I love this sweater! The fabric is super soft and I love the fit. Works well with high waisted pants as the band can tuck underneath! This sweater is so effortless to style. It looks great dressed down with jeans but I also love it dressed up with a skirt or trousers. If you have a longer torso I would recommend sizing up because I found the arms to be a tiny bit short. Bought this sweater in black, loved the fit and immediately bought it in brown and white. I like how this sweater is “cropped” but doesn’t show my stomach. I’ve had two kids and though I’m slim I don’t feel comfortable wearing tops that might creep up. Overall i like this sweater. My only issue is that it is shorter threw the body than the photos suggest. I have a long torso and so avoid many aritzia tops that just stop at the waist because on me these are crop tops. I can really only wear this sweater with high waisted bottoms to avoid bearing my midsection. 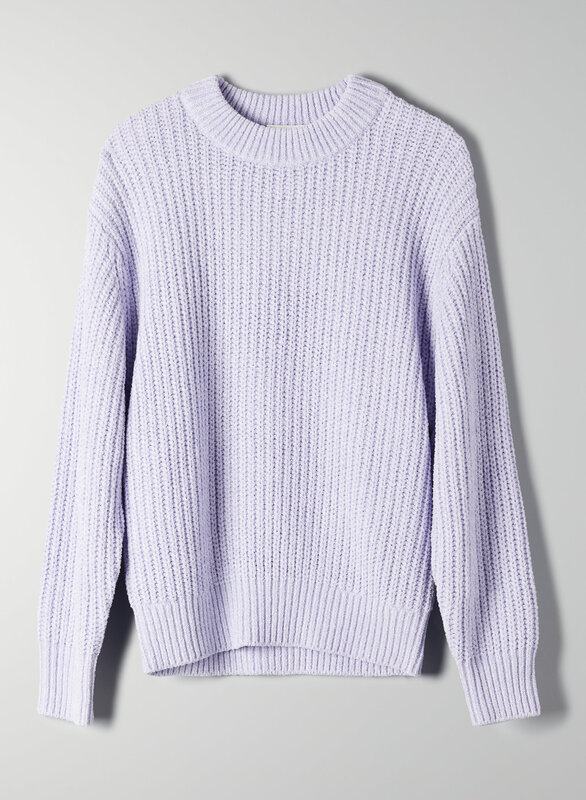 I got the sweater in lavender, the color is vibrant and complements to my skin tone, the material is soft and comfortable, it’s oversized so I sized down to XS. I usually wear a small but that size was sold out. I purchased an XS and M and I love them both. The XS is more cropped so you need a high waist pant. The M wasn’t too oversized. 3/4 length sleeves in both. The knit is divine. So soft... perfect for work or home. I want to wear them everyday. I really like this sweater because its warm without being itchy like wool is. It also drapes beautifully. Very cute and comfy. Body could be smaller since it’s a little too baggy for my liking. Sleeves are a bit short and could be longer but this is a typical issue I have with most sweaters. Love the color and overall look! I usually don’t have a problem with the sleeves being too short at aritzia. For reference I’m 5’10 and ordered a S and the sleeves sit an inch above my wrist. Overall it’s a nice sweater. Modern shape, high cut crew neck that’s warm but breathable. It's very soft and looks very cute! I usually buy my tops in size Small but this sweater runs a little bit smaller so I bought the size Medium instead. For reference, I am 5'3" and weigh 100lbs. Let me start by saying that I love this sweater. I have it in three colours, with no regrets. However, I bought the first one in a size Small because I’d tried it on in store and liked the fit. It was a little looser, with an almost over sized fit. I decided to size down when I bought my second one, thinking it would have a more tailored look. I was surprised by how much smaller it was. The XS is just barely long enough in the arms and must be worn with high waisted jeans- I’d describe it as more of a cropped style. They almost seem like two completely different sweaters, so just beware when sizing down that you may get a different type of fit! THANK YOU FOR MAKING A SWEATER WITHOUT WOOL!!! It's so hard to find nice, quality sweaters that don't contain wool. Thank you for making sweater season so much better! Drapes nicely, super soft and easy to wear. Please make wool-free items easier to find on your website. Like the purple color very much, feel very comfortable and soft, but very easy be snagged. I love how this sweater slouches in all the right ways. It’s super versatile and not too warm. The fabric is so soft as well! I purchased a size xs because it does fit a bit smaller and I wanted it to be a bit looser. 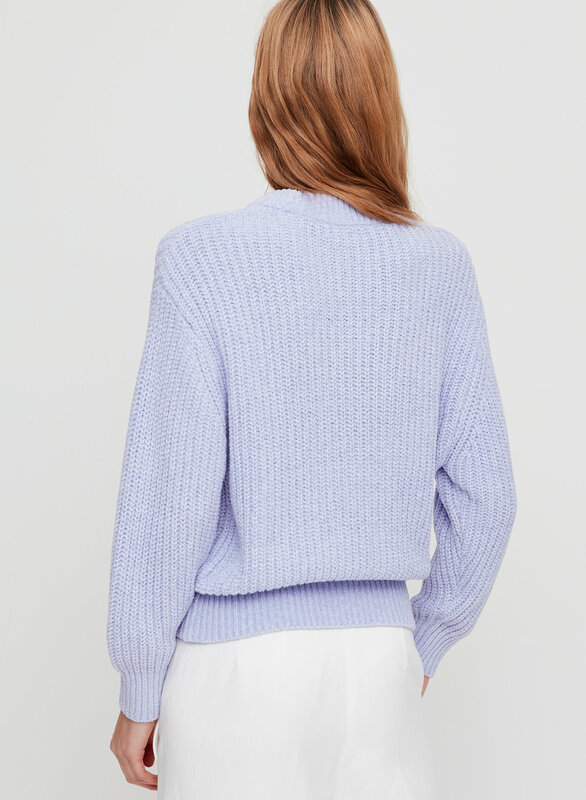 I usually don’t like sweaters that are cuffed at the bottom but this is an exception because it’s so soft and stylish and can be worn with basically everything I have in my wardrobe! I love tucking this in jeans or anything high-waisted which gives an effortless and chic look to my whole outfit! Loved this sweater, but the sleeves were much too short. ( unlike many of your other sweaters styles).